Japanese arare is made of steamed rice, grilled to be pleasantly chewy. 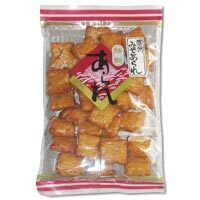 This assortment is flavored with soy sauce and miso with an honest traditional Japanese-like taste. Enjoy the delightful texture as you munch on these!